CB radios reached their height of popularity in the 1970s, but they remain a mainstay of two-way communication between truckers, hobbyists, and emergency first responders the world over. CB radios have a fairly limited range however—generally around 10 miles. This is because they are confined to only four watts of power. To augment the range of a CB radio, you require a CB aftermarket antenna. With a powerful CB antenna, you can boost the effective range of your radio considerably, enabling you to communicate across a much vaster distance. Need to purchase a CB antenna, but not sure what antenna to buy? Check out our comparison table below for prices and features of top-selling models. Still need more guidance before choosing a CB antenna? Read on to learn everything you need to know to make the right purchase. What is a CB Antenna? A CB antenna is simply an aftermarket antenna used to boost the effective range of a CB radio. You cannot buy simply any antenna (like a factory truck antenna) and get the results you need. You need a very long antenna for a CB radio, which is why you need to purchase a specialized CB radio antenna. These antennas are coiled so that they offer you the length you need without too much height. What type of CB antenna do you need? Fiberglass Antennas: These are built using a fiberglass rod, and are very durable and thus ideal for offroading. The range you get will depend on where you mount them and what kind of conditions you are dealing with. Average range: two to seven miles. Magnet Mount Antennas: These antennas attach to your vehicle using a magnetic base. Installation is a breeze, with the downside being that you need to mount them quite high. This can pose hassles when you are driving. Average range: three to seven miles. 102” Whip Antennas: If you are looking for a high range, a whip antenna can give you what you need. They are some of the most powerful CB radio antennas you can buy, but they are also extremely long, which can be inconvenient. Average range: Around 10 miles (sometimes more). Trucker Antennas: These are more formally known as “center-load antennas.” They are commonly known as trucker antennas because they tend to be used on semi-trucks. The bottom third or so is a stainless steel shaft, with the coil sitting above. The top of the antenna is a steel whip. Average range: seven to 10 miles. No-Ground Plane (NGP) Antennas: Need to install a CB radio antenna on a boat or RV (or any vehicle without a metal chassis)? A No-Ground Plane (NGP) antenna is what you are looking for. There are two unfortunate drawbacks: they are expensive and they only have a short effective range. A number of factors influence the range of a CB antenna, including the length and type of the antenna as well as where you mount it on your vehicle (more on that below). Your reception will also be influenced by your location at any point of time. Because CB radios operate through line-of-sight, you will get far better range in a flat, unobstructed desert or prairie than you would in a dense woodland or city setting. You also will get better reception if you are using a single side band (SSB)-enabled CB radio, which allows you to transmit on 12 watts instead of 4, effectively tripling your range. Finally, the quality of your actual installation matters. If you make mistakes during the process, that can dampen your range. Where do you plan to mount the CB antenna? In general, you should try and mount your CB antenna as high as possible; this will increase the range. But it is important to figure out exactly where that will be in advance; that way you can shop for the right kind of mounting equipment. If all other factors are equal, longer antennas will give you a higher range than shorter antennas. Certain antenna builds also tend to provide a higher range. If you have a fiberglass antenna and a trucker antenna of the same length, the trucker antenna will give you the better range. There are both magnetic and non-magnetic mount antennas. Choosing the right mount involves researching your make and model of vehicle. It is recommended that you do this before shopping for your antenna. That way you can shop simultaneously for an antenna and a mount that will fit your needs. Coax: When you are buying a coaxial cable for your CB antenna, try and get the RG8X. This type of coax is thicker than the RG58. It will offer better performance and will last longer than the RG58. External Speaker: CB radios come with built-in speakers, but they are low in power and hard to hear in noisy environments. An external speaker solves this problem. SWR Meter: Make sure before you start using your CB radio that you have tuned your antenna using the SWR meter. You also need to do this anytime you move your radio to a new mount location. Doing this will maximize performance and prevent damage to your system. You may get a higher range from a top name-brand product than you would from a lesser known brand. You now know everything you need to in order to shop for the right CB antenna for your needs. Scroll back up to the top of the page to view our comparison chart for top-selling CB antennas! If you’re looking for the convenience of a magnetic CB antenna but you want just a bit more range, check out the Wilson 305-38. It’s bigger and more powerful than most other magnetic CB radio antennas. A foot taller than most magnetic CB antennas. The extra length gives you significantly better performance and range. High performance magnet. The 305-38’s magnet is powerful enough to hang on to your vehicle even if you like to drive fast. Aerodynamic design. Even though the whip is thicker than most CB radio whips, it doesn’t get tossed around in the wind thanks to its aerodynamic, wind resistant design. Big, heavy magnet. The base of the magnet is nice and wide and it weighs 10 ounces. No scratches. Like most CB radio antennas that feature a magnetic base, the 305-38 features a scratch resistant rubber protector that prevents it from messing up your paint job. The Wilson brand name. 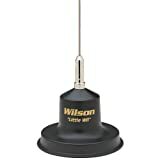 Most CB radio enthusiasts agree that Wilson is one of the best manufacturers of CB radio parts and equipment. Easy to install. If you don’t like reading instructions, just watch one of the many free YouTube videos that shows you every step of the 305-38 installation process. When it’s dry, the 305-38’s magnet works quite well. But when it starts to rain, it will slide off your vehicle if water penetrates the seal. Though this antenna is one of the best performing magnetic antennas on the market, it’s also quite expensive compared to the competition. If you have to do some creative electrical work to hook your CB radio up to your antenna, a few feet of extra coax cable comes in handy. The K40 K-30 comes with 15 feet of coaxial cable, which is more than enough for most types of CB radio setups. Installation is super simple. Magnetic antennas are great for CB radio users who don’t want to fiddle around with complicated clamps or mounts. Strong magnet. 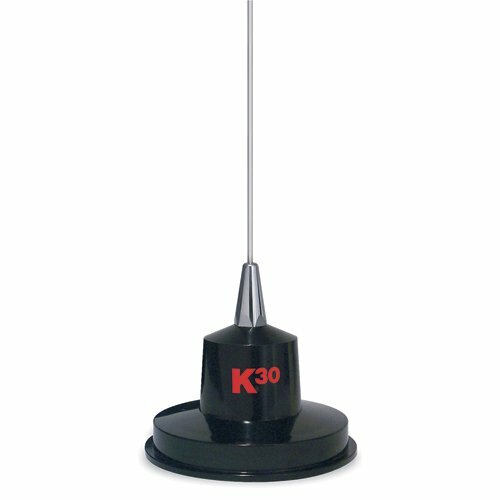 Some people prefer mounted antennas because they believe magnetic antennas fall off easily, but the K-30’s super strong magnet allows it to stay attached to your car or truck no matter what. Cool color scheme. This black and red antenna matches just about any color vehicle, but it looks especially good on dark paint. It handles high powered CB radios. This antenna can handle up to 300 watts of AM broadcasting power. Comes with an extra long coax cable. With the K-30 you get a jumbo sized 15 foot coaxial cable. Great performance. If you invest in a K-30 antenna, you can kiss static filled transmissions goodbye. PL-259 compatible. PL-259 is the most common connector type found on CB radios. The K-30 provides great value and ease of use, but if you want the best performance possible you’ll need to pick up a hard mounted CB antenna. If you don’t know how to tune this antenna, you probably won’t get very good range out of it. Either learn how to tune it yourself or take it to a shop before you use it for best results. Customers in search of a lightweight, versatile aftermarket antenna to use with CB radios may find the FireStik 4, also known as the 4-foot Black Firefly, to be a viable option at a reasonable price. Measures 4 feet and made of balanced materials. The shaft has been reinforced with custom-blended glass fiber. The copper wire used in construction is insulated, and the tip is brass. This reduces corrosion. Rather than make this the strongest antenna or the most flexible one, the manufacturer strived for a balance between both qualities. If you want to increase flexibility even more, you can buy a flexible spring to go with your mounting setup. Lightweight. The antenna weighs a mere 9.6 ounces. NOAA alerts. With this top-loaded antenna, you can keep up with the weather. Ground-plane dependent design. That means that you cannot opt for non-metallic vehicle placement. Good, clear reception. You can really boost sound quality and get decent range with the FireStik 4. Fast and easy setup. You should find installation quick and easy, and tuning a breeze as well. Good price. You can really enhance the capabilities of your CB radio when you purchase the FireStik 4. Since it is reasonably priced, it adds a lot of value to your radio. Durability is not the best. That being said, it is certainly not bad—just use common sense when handling the antenna so that it stays in good condition. The Midland 18-2442 is super easy to tune. All you have to do is loosen a set screw and move the antenna up or down. Simple tuning system. Some CB radios can only be tuned by experts, but anyone who can loosen and tighten a screw can tune the Midland 18-2442. Easy installation. Like most magnetic antennas, all you have to do is attach it to a metal part of your car and hook up the wires. Won’t rattle or fall off when you drive. Even at high speeds, the Midland 18-2442’s super strong magnet ensures that this antenna won’t wiggle, fall off or rattle. It won’t damage your vehicle. This antenna comes with a rubber seal that’s designed to protect your vehicle’s paint job. Great value. 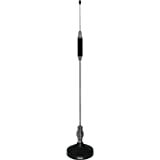 Even though the 18-2442 is built by a brand name manufacturer, it’s actually cheaper than most other CB radio antennas. Quality construction. Midland is known for making great electronics products and the 18-2442 is no exception. 2 mile range in urban environments. The 18-2442 outperforms other CB antennas when it comes to sending and receiving transmissions in cities. If you don’t regularly maintain this device, it’ll eventually start to rust. The whip is not rust proof. The 18-2442 performs well for what it is. However, you can get much better performance out of a professional grade CB radio antenna. great line of products an great information on all items.